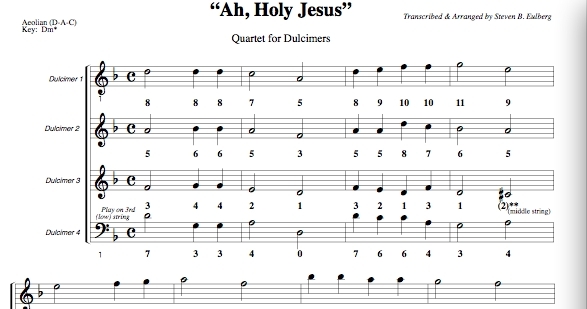 This is a 4-part arrangement in standard musical notation and mountain dulcimer tablature for standard (DAd, DA#d, DG#d) and Baritone dulcimers. Can also be played by Hammered Dulcimers. An accessible 4-part arrangement of J. S. Bach’s chorale setting of Herlizch Tu Mich Verlangen (O Sacred Head, Now Wounded) in D for Dulcimer Orchestra. Can also be played by Hammered Dulcimers. 2) mp3 sound files of each part played louder than the others, to help guide learning. 3) mp3 sound files in “karaoke-style” with each part missing, to be supplied by a player who wishes to practice and provide his or her part, or who lives far away from other dulcimer players. **mp3 files can be played on an mp3 player such as iTunes or others. This music is different from that often played on the dulcimer, but is accessible to players of all abilities! Debuted in performance by The Colorado Dulcimer Orchestra at the 10th Colorado Dulcimer Festival, February 2012. A) If you have purchased the CD-ROM you have also purchased permission to make the copies you need to play with your ensemble. In order to honor the work that goes into creating these arrangements, I respectfully request that if you’d like to make copies for your friends, please send me $1 per copy that you make. I would like to purchase a Mechanical License to make a recording of my group playing this arrangement. Please contact steve (at) owlmountainmusic.com to arrange this.